Finally, another tasting note! 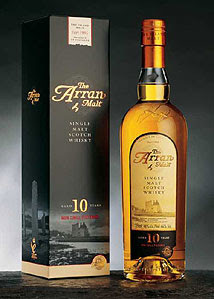 This one comes to us from the Isle of Arran, and the only distillery on the island. As far as the region goes, it's technically called an "Island malt," but that isn't very meaningful; the islands are all different, and the whiskies are said to have little in common. This little light golden dram smells wonderful - light and sweet, malt and melon. It's smooth, despite its high-ish ABV, and slighly vegetal, but not overpoweringly so. A bit of water makes it explode with sweetness on the tongue. This is a delightfully light, airy whiskey - inoffensive in all ways, and very enjoyable. It strikes me as one of the better Scotches I've had, and I'll be sad to see the bottle go!